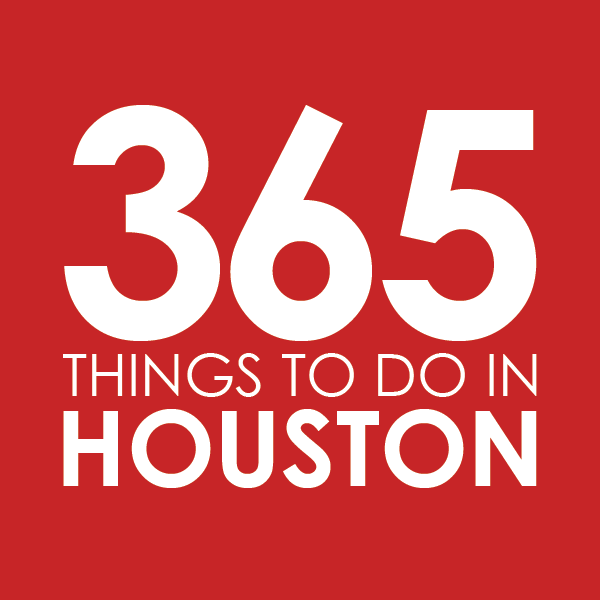 LAST DAY – Become an AIRSHOW insiderTM for FREE & SAVE on WINGS OVER HOUSTON Tickets! don’t pay the gate price – buy online & SAVE! Please read the following, before clicking on any links. Thank you! US Navy Blue Angels & Some of the Best Pilots in the World! The 2018 CAF Wings Over Houston Airshow is proud to host the United States Navy Blue Angels and some of the best military and civilian aviators in the world on October 20th & 21st at Ellington Airport, Houston, Texas. This will be an extraordinary airshow! We’re very excited to announce some exciting airshow ticket improvements for 2018. 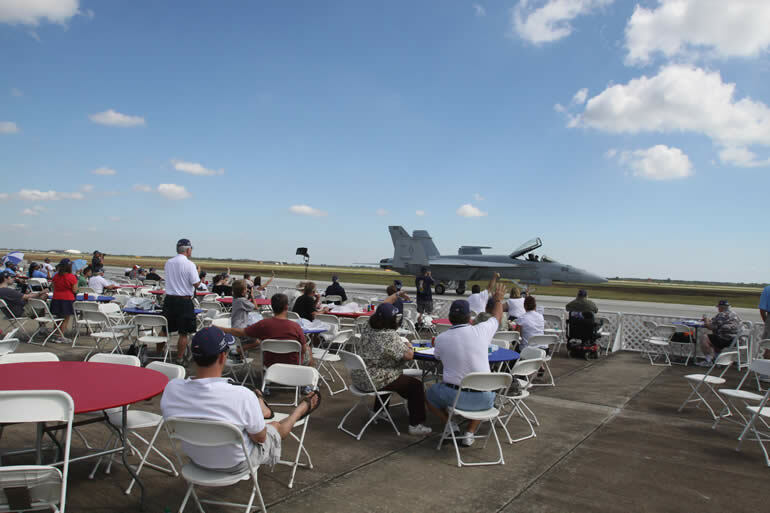 Our goal is to provide you the best air show experience possible at a range of price points. Ticket types include everything from an affordable day of aviation thrills for the whole family to an ultra-premium air show experience. There’s something for everyone! 2017 Prime view customers, you will receive a special email and link at launch to renew your seats. As always, Prime View customers will have first dibs on the seats they purchased the previous year. Purchase prior to August 1st when all open seats are available to the public. Thanks for your support! 2018 Prime View tickets go on sale to the public on Aug 1st. If you have any issues with your ticket purchase, please call our ticket service provider eTix at 800-514-3849 between 9 AM – 8 PM Eastern Standard. eTix customer service representatives are great at helping our airshow customers. 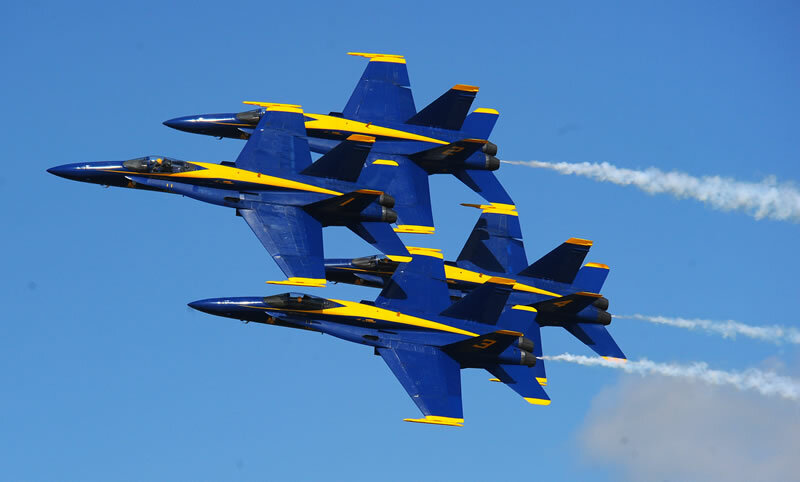 Pictured above: United States Navy Blue Angels from show center. (The picture above is NOT “Photoshopped,” but pure aviation skill and precision.) 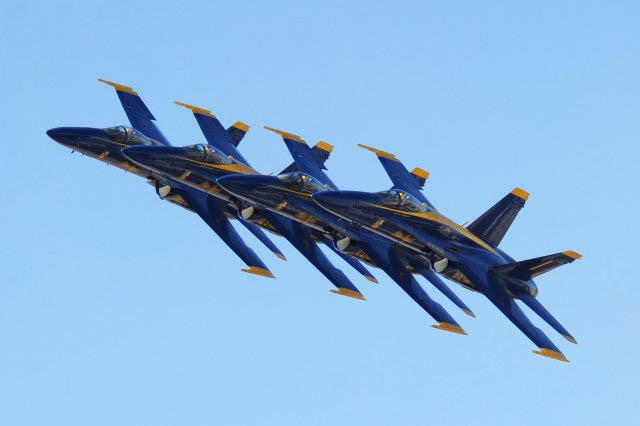 The Blue Angels fly as close as 36 inches apart at hundreds of miles per hour. Here’s the bottom-line… The most heart-pounding/spine-tingling action takes place at the airfield. Nothing else comes close!Simply put . . . you wonít see the action in the picture above from the backyard or side of the road. Go where the action is in MAX afterburner >>> AT THE AIRSHOW! Please note: Discount pricing is automatically applied to any tickets you select during the checkout process. The prices you see in the cart are discounted prices. If you want better pricing, please become an Airshow Insider Just click below and select your tickets. We have amalgamated our Family Pass and Child tickets into our brand new General Admission ticket. Buy online and avoid the on-site ticket purchase lines! The Family Chalet area is built to be kid friendly. Our focus is on making sure you and your children have a spectacular time at the air show. Thus, no alcohol service in the family chalet area. The Family Chalet area will include the food your whole family can enjoy. Important Note: Family Chalet tickets do NOT include a parking pass, but includes FREE General Admission parking, due to the per-person cost of catered food and beverage. A RESERVED SEAT at airshow center . . . for a PRIME VIEW of all the jaw-dropping aviation action! Please note: Your Insider ONLY discount is automatically applied to any tickets you select during the checkout process. Saturday Eagle Squadron VIP Tickets are SOLD OUT! Eagle Ticket Squadron tickets are still available for Sunday.Important Eagle Squadron NOTE: Eagle Squadron tickets are an online only purchase. Eagle Squadron upgrades might be available airshow weekend on site, at the Eagle Squadron tent. In 2016, the last time the Blue Angels were in Houston, Eagle Squadron sold out. Up-Front VIP ONLY Parking (right by Eagle Squadron Tent) — Your printed ticket is also your parking pass! Breakfast: Breakfast Tacos, Fruit, Coffee, and Danish 8:00 – 10:00 a.m. Lunch: Scrumptious 3-Meat BBQ Buffet — 11:00 a.m. – 2:00 p.m. Please note: Tickets are good for ONE DAY ONLY, Saturday or Sunday. Everyone including children are required to purchase an Eagle Squadron ticket. Make sure to take a look at our Family Chalet for kid-friendly options. Please remember Eagle Squadron VIP Tickets are an ONLINE ONLY Purchase! Photo Pit Ticket (8AM – 5PM) – SOLD OUT! Specific for Saturday or Sunday-limited to 100 per day. Always sells out, purchase early to save your spot online only. Photo Pit Pass for the serious Photographer! Includes exclusive up front access for those great shots. Has elevated risers, tented area, beverages, boxed lunch, restrooms, reserved parking area. Sunrise Photo Tour Pass – SOLD OUT! Trying to get that great morning sunrise shot! Price increases as show draws nearer. Combo Sunrise Tour/Photo Pit – SOLD OUT! Both tickets for one discounted price. The price of your ticket includes FREE Parking & Shuttle Bus service. For assistance ordering tickets, please call eTix at 800-514-3849. All Airshow tickets can be ordered and printed on your own printer through our ticketing partner eTix. Avoid waiting in lines! You place your order and pay online, and then print your tickets on your own home or office printer at your convenience. *Service Fees: Some ticket types include a nominal service fee. All ticket transactions and payment are processed through an industry-standard secure online interface. Aircraft and air show performers (military and civilian) are subject to change without notice. If something changes, we’ll do our best to let your know.